Crop-destroying Fall Army Worm (FAW) caterpillars (locally known as ‘Sena’) that have devastated agriculture in many other countries including India are now spreading rapidly in all parts of the island posing a serious threat to local maize cultivations. These species of caterpillars were first detected in Nigeria in 2016 and in India last year. According to the Food and Agriculture Organization of the United Nations (FAO), the FAW, which devours crops during the caterpillar stage of its life, can spread at up to 100 miles a day. 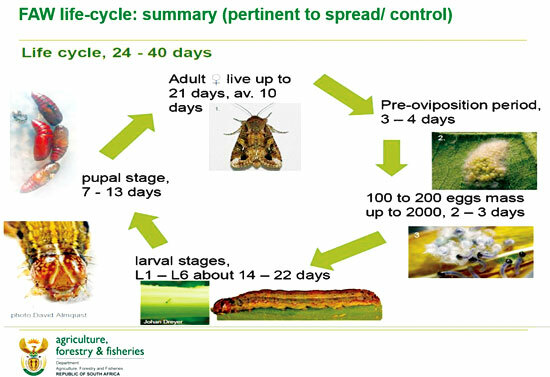 In the larval stage, the FAW damages crops and a FAW can eat up to 1,000 acres in one day. Though maize is its preferred meal, it can also eat paddy, sugarcane and 80 other crops. Also, a moth can fly up to 100 km per night, while a female moth can lay up to 200 eggs at a time. The suppression of the pest was a challenge to every country from where it was reported, due to its ability to quickly adapt to insecticides. However, the Agriculture Ministry has set up a Task Force to control this menace and the Agriculture Department has recommended five types of pesticides for the control of the caterpillar. The Ministry has also taken necessary steps to provide a 50 percent subsidy for pesticides. Agriculture Director General (DG) Dr. W.M.W. Weerakoon told the Daily News that there are viruses which could infect this pest which are used in other countries, and the Ministry plans to use integrated pest management technologies to bring down the infestation of the fast-spreading FAW. Apart from the short-term measures, the Agriculture Department has taken long-term measures to develop some kind of resistant or tolerant variety and bio-control measures to curb the menace. “The Department initiated weekly campaigns in November and December last year. An islandwide campaign is being held from January 16-31. We are also going to launch an islandwide campaign with all the officers - not only from the Agriculture Department, but also from the Agrarian Services Department, Mahaweli Development Authority and university students. We are also getting the support of the FAO and other international organisations and universities to curb this menace,” he added. The ‘Sena’ caterpillar menace initially detected in the Ampara and Anuradhapura districts, has now spread to several other districts. The caterpillar variant has caused damage to corn fields and reports stated that it is now affecting other types of crops as well. The DG said that the maize crop is now maturing and the pest may spread to the paddy fields. The Agriculture Department has already advised paddy farmers to be vigilant and to take immediate measures to mitigate the spread of the pest. Agriculture Ministry Secretary K.D.S. Ruwanchandra said that the Ministry is taking all possible measures to curb the menace. “According to the statistics of the Agriculture Ministry, around 50 percent of 80,000 hectares of maize have already been affected and the economic loss is less than 20 percent,” the Secretary said. He further said that the Agriculture Department had received information that the FAW attacked the crops in India since March 2018. The Department has been vigilant since then and informed all the field officers and the farmers to be watchful. 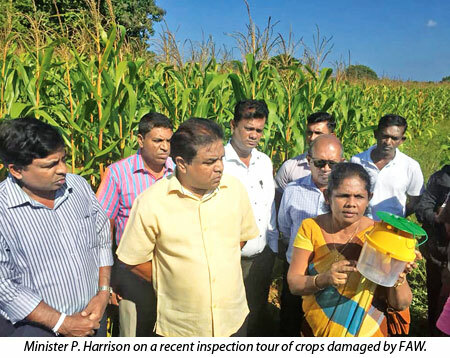 “Three-and-a-half months ago, we received information that the FAW had been detected in maize crops in Anuradhapura and Ampara. From then onwards, we started to educate farmers and introduced all mechanical and chemical measures that can be taken to control this menace. But during that time we didn’t have a specific chemical since this was a new pest. However, we immediately started to identify the chemicals,” he said. The Fall Army Worm moth has dark grey, mottled forewings with light and dark splotches, and a noticeable white spot near the extreme end of each. Newly hatched larvae are green in colour and move in a looping motion. The FAW larvae are smooth-skinned and vary in colour from light tan to green and they have three yellow-white hairlines down their backs. Full-grown larvae are about one-and-a-half inches (38 mm) long. The face of the mature larva is also marked with a white inverted ‘Y’. Agriculture, Rural Economic Affairs, Livestock Development, Irrigation and Fisheries and Aquatic Resources Development Minister P. Harrison said that he plans to submit a Cabinet paper seeking the approval of the Cabinet of Ministers to pay compensation to farmers who were affected by the FAW. “None of the FAW-affected countries has been successful in finding a permanent solution for this. Since we have to deal with food crops, we cannot use hard toxins to destroy the FAW. So we are still conducting various experiments to find a permanent solution,” he added. The National Invasive Species Specialist Group (NISSG) (established by the Environment Ministry) Chairman and Senior Professor of the Crop Science Department, Agriculture Faculty - Peradeniya University, Buddhi Marambe said that the first thing we have to do is to bring the FAW population density down to a manageable level. “We cannot manage the pest at this very high population density. If the population density is high then the damage is also high. That is natural. There are different shock treatments. I am not saying that the pesticides are the best. The Agriculture Department has recommended a few pesticides. What we have to understand is that a single treatment will never work in all locations and across borders,” he said. Prof. Marambe said the Agriculture Department has established a co-research team including the members of universities to work on this. “There could have been prevention measures if we knew the way the pests entered the island. Usually, Sri Lanka’s quarantine practices are good. So, we still do not know how the pest entered the country. We can bring historical evidence and international experience from different countries,” the Professor said. He said the pest has existed for 100 years, as for example, in the USA where they have struggled a lot and finally been able to manage the pest at a certain level. “Once the population density is brought down to a sizable level, then we can go for integrated pest management techniques. Combination of different techniques can be used. Use all available techniques to bring down the population density to a manageable level. That is the key point for this type of invasion. Whether it is a plant or an animal, you have to handle it,” he said. A female farmer in Kahatagasdigiliya, Anuradhapura, shared her tragic story with the Daily News. She has cultivated corn in three acres, but is now compelled to destroy her cultivation. She has obtained loans in order to buy corn seeds and some pesticides that were recommended. She explained that the family is barely surviving these days with the help of a few additional crops that she had been able to cultivate. “We hope that the government would intervene to provide a solution to this menace,” she said. It was with great hope that farmers cultivated maize this time, after having suffered from a paucity of rainfall for four consecutive seasons. But the Sena caterpillar menace has dashed their hopes. The farmers explained that they had invested all their money in their cultivations and as a result, they had ended up with nothing. Wayside boiled maize vendors have been badly affected by the menace as customers are afraid to buy maize after some media reported that the FAW were found in the boiled maize that is being sold by these vendors. Commenting on this, the Agriculture Director General said that maize is not unsuitable for human consumption merely because the FAW is found in them. “Even though we can find the caterpillar in the maize pod, very rarely does the caterpillar damage the pod,” he said. All Island Farmers Federation National Organiser Namal Karunaratne said that the caterpillar menace had first been reported in the Damana region of the Ampara District in June last year and has already destroyed nearly 50 percent of the country’s corn cultivation creating a loss of nearly Rs. one billion. He charged that the government’s efforts to curb the pest have been largely inadequate. “The government must look at the issue as a national problem and take immediate and firm action to curb this menace,” he said. Thilak Kandegama who is an expert in traditional farming said that Sena cannot be controlled through chemical measures and now, agricultural experts should listen to farmers who engage in traditional agricultural practices and experiment with traditional pest management practices to control the pest. “Pests are not new to Sri Lankan farmers. Our traditional farmers have successfully controlled pests using traditional methods such as spraying of ‘pirith pen’, ash and other natural substances,” he said. 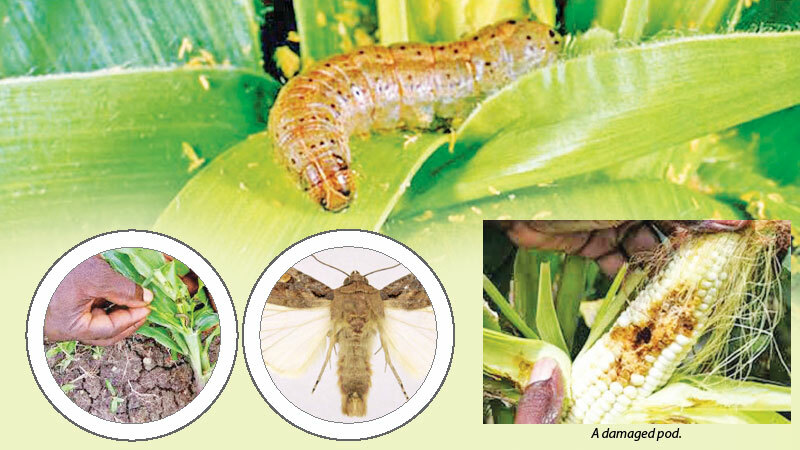 According to Kandegama, Sena caterpillars mainly attack the maize varieties Pacific 984, Jet and Pacific 999. The American variety has not yet been affected by this pest. “This is evidence that I can provide for scientists who conduct any research on this,” he said.